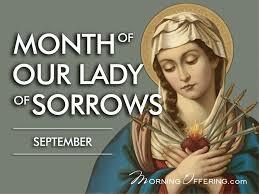 The entire month of September is dedicated by the Church to the honor of Our Lady of Sorrows. The devotion to Our Lady’s sorrows remembers the Blessed Virgin Mary’s spiritual martyrdom in with her perfect union with the Passion of Christ as she stood at the foot of the Cross. This was her part in salvation history, and thus she is a spiritual Mother of all Christians. SHARE these Powerful Prayers Against Evil and Change the World! 3 Hail Mary's are added in remembrance of the tears Mary shed because of the suffering of her Divine Son. These are said to obtain true sorrow for our sins. V/. Pray for us, O most sorrowful Virgin. Lord Jesus, we now implore, both for the present and for the hour of our death, the intercession of the most Blessed Virgin Mary, Thy Mother, whose holy soul was pierced at the time of Thy passion by a sword of grief. Grant us this favor, O Saviour of the world, Who livest and reignest with the Father and the Holy Spirit, forever and ever. Amen. and meditating on her tears and dolors. This devotion was passed on by St. Bridget of Sweden.